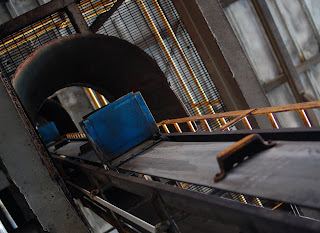 This view (looking up) is a personnel lift at the closed Georgia Pacific paper mill in Bellingham WA. The lift carried workers up the four stories or so to the top of the building containing the debarking mechanism. It has been idle for 9 years, but still smells of wood chips. Wiki notes that "this type of belt lift is considered too dangerous for public use." Signage indicates that the lifts are for employee use only; visitors had to take the stairs. I used similar lift at paper plant, loved it.